This is a picture of the coffee mug I'm using today. My wife gave it to me for Christmas. I picked it out, because it is exactly what I'm doing in 2018. Messages like this have always inspired me. My preferred decor has always been words, typically written in black permanent marker on a 3 x 5 index card. I like the simplicity of words and paper, and like that the receiver of the information can go back to the words anytime they'd like. There's no fluff, only message. I used this style when I had full charge of the decor in my first classroom, and put a lot of time and effort into what went on the walls. It couldn't be just anything, it had to be something I found inspiring, which was usually something slightly different from the norm. I like quotes and phrases that make you think differently. This stemmed, no doubt, from my love of Bob Dylan. I was introduced to Bob Dylan when I was 16 or 17 by my friend Matt. A big group of us - all my friends at the time - was on a tubbing trip with our church youth group. In the tent at night, during free time, Matt played a song for us. He'd recently stumbled upon a new artist, and wanted to share him with us. "I want you to all listen to this song," he said, "and then we're each going to say what we think it means." We each placed a candy cigarette in our mouths, took a swig of Dawgs-n-Suds root beer, and listened. This eerie music came through the speaker, and this old-sounding, wise voice sang softly but strongly, "Oh my name it ain't nothing, my age it means less...". The artist was Bob Dylan. I was hooked from song one. Dylan ended each verse with a statement that, insert person, too "had God on their side." The plot of the song, With God On Our Side, goes like this: someone does an act of violence, claiming they did it in the name of God. The examples start simple but progress in violence, ending with Judas Iscariot betraying Jesus Christ. The listener is sucked into the justification of violence, and must come to terms with what is acceptable in their own minds. When the song ended, we all sat there for a minute. My 16-year-old mind was blown. Music, prior to this, had been fun, or spiritual, but this was philosophical. There wasn't a direct 'praise God' or 'I love my lady', you had to think. We went around the circle, sharing our thoughts. Matt would fire back a 'what about this?' question (he's now a philosophy professor). . It was a bit abstract for us, but we were intrigued. He repeated the process with The Times They Are A-Changin'. The discussion in that tent was a very important moment for me, probably one of the most transformational of my entire youth. I loved the songs Matt played, and wanted to hear more. I'd never heard anything like it, songs used as stories that took you deep into your own thoughts and beliefs. When he mentioned Judas, I was like - of course Judas didn't have God on his side: he killed God. But then I had to question my own logic: if I agreed with one part of the song, could I disagree with another? I haven't stopped listening to Bob Dylan. As I became familiar with his canon of work, several of his quotes made the wall. One staple was: "He not busy being born is busy dying", from It's Alright Ma, (I'm Only Bleeding). There were also quotes from books I read, movies I watched, songs I heard. Anything was a possibility. The only criteria was that the quote had to make you think in a different, new way - and be inspiring. Those were the effects of a good quotation upon me, and I wanted to pass that on to my students. This decor also meant that I was that I was looking for inspiration everywhere. The other effect was that with anything being an option, everything was. If a quote could summon a feeling, it was fair game and may be on the wall. A major reason I put so many things like this on the wall was that if a kid got bored in class, and his or her mind started to wander, perhaps they'd chance across one of these quotes and be inspired. Perhaps they'd remember the quote and be better for it. A win. Kids would look at the walls, too. I was able to set a tone. Students would walk in and glance at the words. I was able to show my personality through the art. It's always worked this way for me, words being the foundation of inspiration. 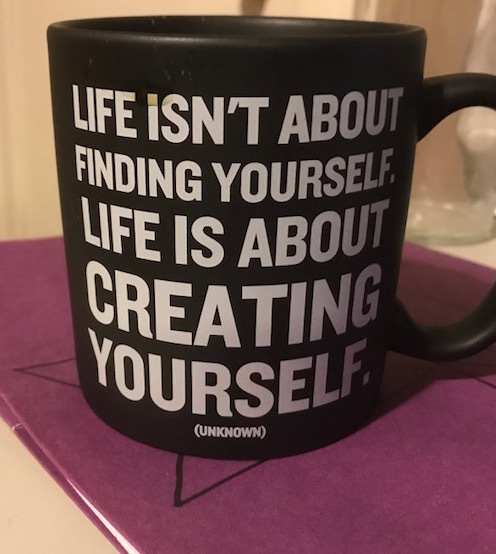 Quotes and phrases, like the mug I'm using today, are reminders that we do have a chance to create ourselves, every day. And since it's daily, that could be today. If I have the opportunity to create myself, right now, today, that means that opportunity could walk through the door in the next moment. It means the the interaction I'm about to have could lead to something. This could be an opportunity to volunteer, could be the affirmative answer to a question, or putting your name in the hat for some exciting thing. Since you don't know, you have to be open.